MULLINS — Two Horry County sheriff’s deputies transporting mental health patients drove through "miles" of floodwaters and disregarded an alternate route before water submerged their vehicle and drowned the two women on board, authorities said Friday. New information surfaced as the State Law Enforcement Division leveled manslaughter charges against Stephen William Flood and Joshua Dean Bishop, alleging the law enforcement officers ignored warnings to avoid “clearly dangerous” floodwaters in the aftermath of Hurricane Florence in September. Nicolette Green, a 43-year-old Myrtle Beach resident, and Wendy Newton, 45, of Shallotte, N.C., had no criminal histories and were being committed to hospitals to get evaluations. Locked in a cage in the back of the sheriff’s van, the women drowned when the vehicle was swept off a road and sank into a large hole from a washout outside the Pee Dee town of Nichols. Their deaths horrified the public and prompted state lawmakers to review how mental health patients are treated in South Carolina. 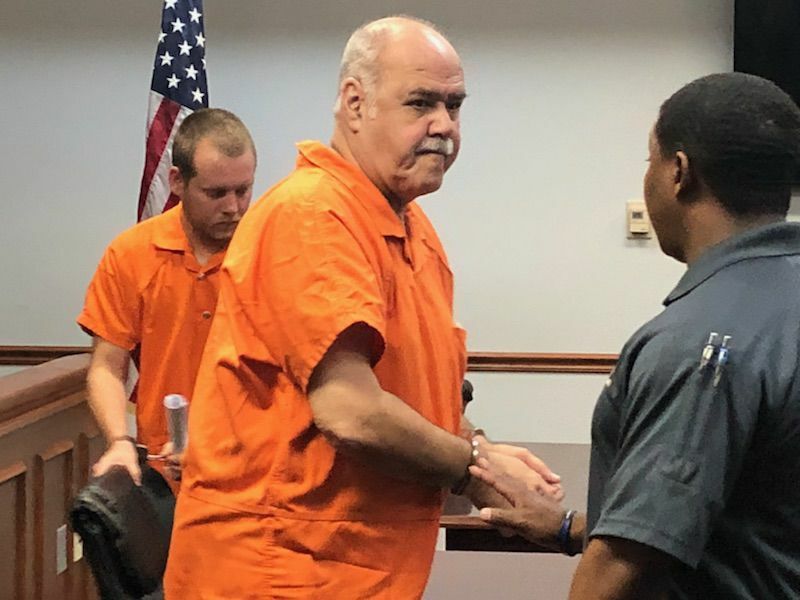 Flood, 66, of Marshwood Drive in Myrtle Beach, and Bishop, 29, of Leatherman Road in Conway, are each charged with two counts of involuntary manslaughter, punishable by up to five years in prison. Flood, who drove the van, also faces two counts of reckless homicide, an offense that carries up to 10 years behind bars. The men, who were fired for their actions last year, appeared in a Marion County courtroom for a bond hearing Friday. Linda Green, Nicolette Green’s mother, fought back tears as she blamed her daughter's death on the "stupidity and selfishness" of the deputies. She and Newton’s loved ones asked a judge to ensure that Flood and Bishop remained in jail as they awaited trial. "They killed her," Green said of her daughter. "Now there is no amount of justice to heal my heart." Wearing orange jail jumpsuits, Flood and Bishop listened in silence to the families’ pleas and sobs. Their attorneys asked the judge to consider the former deputies' reputations and standings in the community. Flood’s attorney, Allie Argoe, called her client the "nicest, gentlest man." Argoe went on to call the deaths a "horrible accident." Bishop, who worked for six years as a detention deputy for the Sheriff’s Office, and Flood, a 10-year veteran, were fired Oct. 24 for misconduct. "To say that this is a tragedy is an understatement," Magistrate Cheryl Graham said after she set bail at $30,000 for Flood and $10,000 for Bishop. Both men were released Friday after posting bail, court records show. On Sept. 18, the day of the drownings, Newton went to a hospital in Loris after suffering schizophrenia symptoms, Tommy Brittain, an attorney for her family testified during a Senate hearing in November. A decision was made to transfer her to a hospital in Darlington. Green also sought help that day. She visited a mental health clinic where a counselor moved to get an order to commit her for evaluation. She was taken to a detention center and then to a hospital in Loris, where staff decided to send her to another facility, her sister said previously. Doctors had ordered emergency care for the women. State law requires officers to take such patients to hospitals in most situations. A 2016 revision in the law allows emergency medical technicians or family members to take certain patients to the hospital, but law enforcement officers usually do the job. Flood and Bishop were tasked with transporting the women outside of Horry County for treatment. Floodwaters from Hurricane Florence had inundated parts of the region. West of Nichols, the Little Pee Dee River spilled over its banks. Downstream in Galivants Ferry, the river would eventually crest at 17.21 feet, well above its flood stage of 9 feet. Supervisors provided a safe route before Flood and Bishop left the jail. A fellow transport officer warned them that the route through Nichols would not be passable, affidavits said. But Bishop and Flood took the flooded road anyway, authorities said. Testimony from the Senate hearing indicated the pair passed at least two points where they could have turned around: a barricade and an S.C. National Guard checkpoint. The Horry County Sheriff’s Office has said that National Guardsmen, acting on orders to let law enforcement around barriers, waved the van through a checkpoint on U.S. Highway 76 near Nichols. Maj. Gen. Robert E. Livingston Jr., South Carolina's adjutant general, said in a statement provided Friday he was "neither aware of any wrongdoing by any members of the National Guard nor aware of anything we did that contributed to this horrible accident." A SLED spokesman declined to comment Friday while the case is open. The van continued through shallow floodwaters that covered Highway 76, but the water got deeper. Then the van stalled out and water swept it across the road. The vehicle came to rest against a guardrail as water rushed by. Bishop escaped the van and helped Flood, who couldn’t get out on his own. Green and Newton were not in restraints, but they were locked in a transport cage in the back of the van and couldn’t open it from the inside. Bishop attempted several times to help the women get free from the metal compartment, according to affidavits. Brittain, the attorney for Newton's family, testified in November that the deputies opened a back door but did not have a key to unlock the cage. With Green and Newton trapped inside, the van sank into a large hole formed from the washout in the road. Rescuers reached the deputies by boat. Divers recovered the victims’ bodies the next day. Authorities were unable to recover the van until nearly a week after the drownings. Authorities allege that Flood and Bishop acted with criminal negligence and a reckless disregard for the patients’ safety. Both men ignored a "visible and dangerous situation,” 12th Circuit Solicitor Ed Clements said in court. While Bishop wasn't behind the wheel, Clements said he "had a duty" to stop his colleague before they drove through the floodwaters. As for Flood, Clements said the deputy made the decision to drive through "miles of water" with the two women locked in the back of the vehicle. "He just ignored all of that," Clements said of Flood. In firing the deputies, Horry County sheriff's officials also said Flood made a “conscious decision” to drive around a barricade after supervisors provided a safe route, according to termination records. Officials faulted Bishop for not making a “conscious and conspicuous” effort to stop Flood. In the aftermath of the deaths, state lawmakers are drafting legislation to prevent “this avoidable tragedy” from happening again, said Sen. Marlon Kimpson, a Charleston Democrat leading the effort. The Senate subcommittee is considering increasing the training requirements for law enforcement officers who transport patients — a common practice in the Palmetto State. They’re also weighing whether to make it easier for family members to transport people seeking treatment. The criminal charges filed Friday may provide some solace to Green’s and Newton's families, but their loved ones said they are still confronted with horrors daily. "Her feelings, her horror, her screaming will never leave my mind's eye,” Linda Green said of her daughter. Reach Andrew Brown at 843-708-1830 or follow him on Twitter @andy_ed_brown. Reach Angie Jackson at 843-937-5705 or follow her on Twitter at @angiejackson23. State lawmakers want to increase the training requirements for law enforcement officials who transport mentally ill patients — a common practice in South Carolina. They are also weighing whether to make it easier for family members to transport people who are seeking treatment at a hospital or another pyschiatric facility.